if you have access to high-speed internet, you will greatly benefit from the video presentation An Update on Silage Management by Dr. Limin Kung (University of Delaware Extension), one of the nation’s foremost silage production experts. to learn more about how to decide which type of inoculant to use, see Help in Choosing and Effective Silage Inoculant by Dr. Limin Kung. Be patient. If it looks like there is a chance that the corn will be harvestable, monitor the field every few days to see what happens. If your fields were flooded, report it to your insurance company immediately: do not wait for damage to become evident. In fields that were flooded but you believe will probably be harvestable, note whether the plants are physically damaged in ways that will allow pathogens to begin invading the stalk and ear. Look inside the husk to note whether fungus is beginning to grow. If the plants are physically damaged, or quality is visibly deteriorating, plan on harvesting sooner than later. It is better to put the silage up a bit wet than to have high levels of mycotoxins develop and otherwise lose yield or quality. Also, it is obviously wise to avoid harvesting areas that are excessively contaminated. 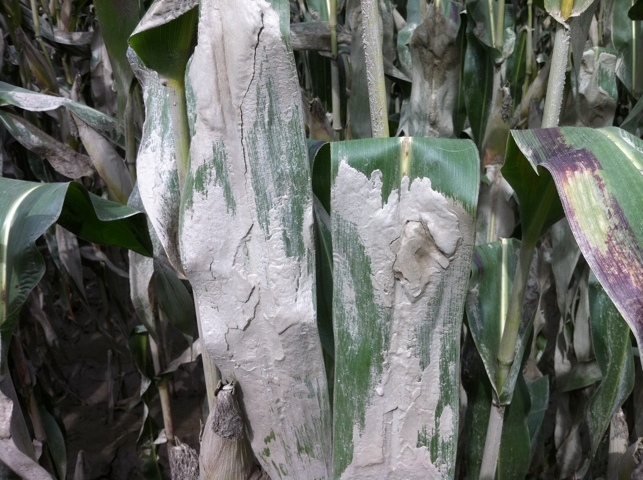 Silt-covered corn will put out a lot of dust when it is being chopped, so it is necessary for those in the field to use all means necessary to protect their respiratory health. The silt is also abrasive, so it will be very hard on machinery and operators will need to take extra pains to ensure knives are sharp and to be prepared for extra repairs. It is advisable to inoculate with lactic acid bacteria (LAB) from a reputable company. It may cost up to $3-4/ton for a good inoculant, but do not skimp on the rate. Dr. Kung emphasizes that there are many LB products that are on the market that do not supply the recommended number of bacteria per gram of harvested forage, and farmers should be wary of such products. Recommended ratea are 100,000 cfu/g of harvested forage for homolactic bacteria and 400,000 cfu/g of harvested forage for when L. buchneri is part of the inoculant formulation. In circumstances where there flood waters have contaminated the corn plants, doubling the rate may be advisable. . 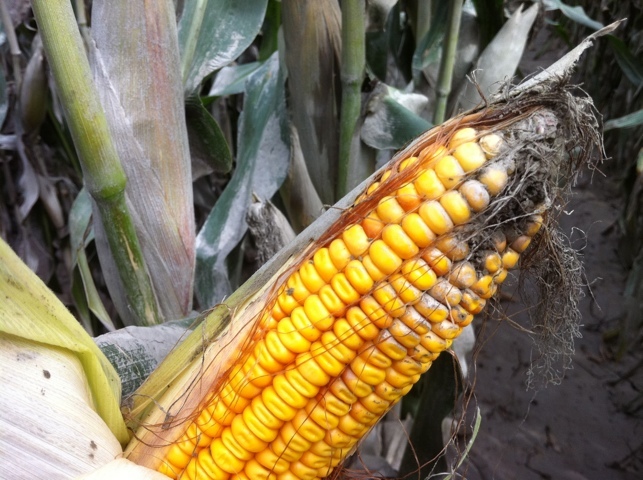 If the situation demands that the corn be harvested wetter than is ideal (i.e., 28-30% DM), the silage should be treated with a straight homolactic LAB inoculant (do not include L. Buchneri inoculant) as described above as well as 2 – 3 pounds of buffered propionic acid. These products should not be mixed in the same tank and ideally would enter the silage stream at different points. Silage harvested at these high moisture levels should not be inoculated with L. bucherni as this may cause more acetic acid to be produced than is ideal. If harvest moisture levels are typical (i.e., 32 – 37%) and the corn has soil contamination, inoculation with a combination of homolactic LAB and L. buchneri is highly recommended. Growth of molds and fungi are inhibited by acetic acid, and L. buchneri causes acetic acid to be formed in the silo and can increase the stability and quality of the end-product. If the corn was significantly covered with silt, be aware of the possibility of higher than normal nitrate accumulation in the plant. Being covered with silt can have the same impact on plant nitrate accumulation as cloudy weather can, so pay particular attention to nitrate levels when looking at the forage quality reports. The Penn State Article Beware of Nitrates in Corn Silage speaks to some important details surrounding this issue. 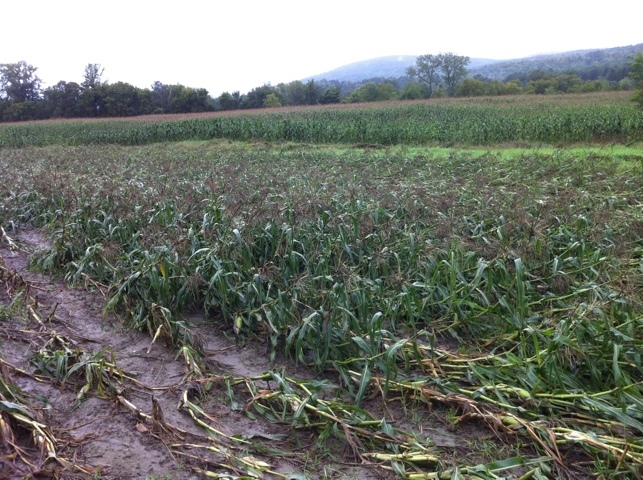 Flood damaged corn (and haylage) should be segregated (i.e., stored in different ag-bags, piles, bunker silos, etc) from crops harvested from undamaged fields. While we can do much to improve the odds of the ensiling process going well for flood damaged corn, it is not guaranteed. Spoilage may still occur, mycotoxin levels could be too high which can cause adverse effects on lactation and permanent damage to the cattle. Further, mycotoxins are an inhalation hazard for farmers and labor. More detailed information about mycotoxins in dairy rations can be found in the article Corn Quality Challenges: Effects on Dairy Cattle. If you have mycotoxin concerns, you should work closely with your veterinarian on feed-related issues. Have a “Plan B” in mind. Talk with your feed dealer about the relative costs of various options if none of the silage harvested from your flooded fields is able to be fed. Talk with your lender sooner rather than later if the disaster has affected your projected needs or ability to repay. If you have any questions related to agronomy, corn silage harvest, or crop-related problems associated with Hurricane Irene, please contact any of the UVM Extension Agronomists below.